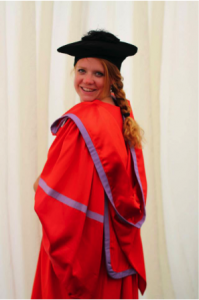 I obtained my PhD from Durham University in May 2014. The PhD was on the motivations of technology use by older adults. I then became a KTP research associate in Digital Health at the University of Salford in January 2015. This journey has allowed me to extend the research experience I already had; I have learnt a lot about processes in the health context and I have also had great opportunities to attend courses and conferences. I studied for my PhD at Durham University Business School, however, my interests have always been in the well-being of people and how behaviour change can improve health and lifestyle. It therefore felt like a natural step to move more into the public health domain. I am now working with GPs and healthcare professionals on a particular digital health product for patients with long term conditions. This move has meant that I’ve learnt a lot about the research process in public health in a very short period of time. Being thrown into the deep end, I quickly learnt about the intricacies of local approvals, CCGs, CSUs and the IRAS website, which were all completely alien terms before I started at Salford. I can now, however, take confidence that I understand a little but more than I did before. 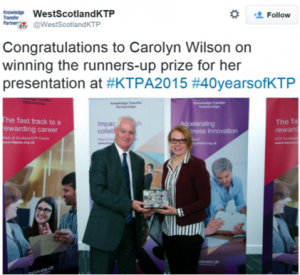 The KTP has provided me with great opportunities to attend conferences and courses. Having previously undertaken an unfunded PhD, this was a very exciting prospect and like a kid in a sweet shop, I definitely made the most of it. I’ve present at the 40th Anniversary KTP conference in Glasgow and at workshop on Digital Innovation in Health at the University of Salford. I’ve also attended courses on management, systematic reviewing, academic writing, digital health and the behavioural science of self-control. Alongside being a research associate in Digital Health, I also teach online MBA and MA modules at Durham University Business School on a part-time basis. I have been teaching since 2011 and as a result I’ve taught on a wide variety of topics from methods of inquiry to social media strategies, improving management decision making and crisis management. I really enjoy both teaching and research and hope to continue these to a high level throughout my career. 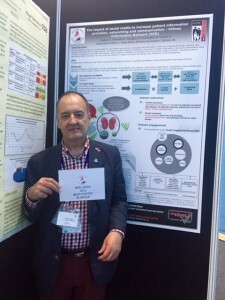 The research that I am currently undertaking is part of a Knowledge Transfer Partnership (KTP) between Dynamic Health Systems (DHS) and the University of Salford. The initial brief was to evaluate the effectiveness of VitruCare, a digital health service, at helping patients self-manage their own health. As the project has progressed, the research has also and we now have three different versions of VitruCare to evaluate. The first is VitruCare for people with Long Term Conditions (LTCs): this service involves patients setting goals and action plans on how to achieve these goals. It provides a health tracking service for any measure the patient chooses; blood pressure, weight, food intake, exercise, time spent watching TV etc, with the idea that the patient can visualise their progress as they strive for a healthier lifestyle. The research on this cohort involves measuring patient health, symptoms, well-being and self-efficacy of managing chronic disease across an 8 month time period at baseline, 4 months and 8 months. Satisfaction is also being measured (4 months, 8 months) and focus groups are being held with both patients and healthcare professionals (HCPs). The second version of the system is VitruCare Lite, which is intended for patients with hypertension or diabetes. The aim of this system is to provide the patient with pre-set goals and action plans so that they can move quickly to adding in values to their health trackers. It is essentially a time saving version of the system. These patients are being measured in the same way as the LTC cohort and results will be compared to see if there is a benefit to the goal setting and action plan creating process. The final version of VitruCare has been designed for patients in palliative care and is more centred on the well-being of the patient. 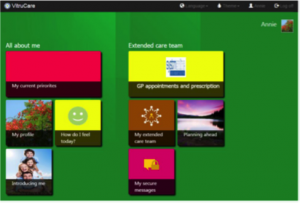 As a result, the system provides the patient with trackers for mood, energy, symptoms and pain, an online space for a diary and a secure messaging service that can be shared with their HCPs. The benefit of this system on patients nearing the end of life is being investigated through repeated measure questionnaires at baseline and 3 months, focus groups, satisfaction questionnaires and extraction of information entered into the system. The three different versions of the system that have emerged over the past 12 months may have reduced the numbers for a large quantitative study but we can look at the service development journey for three different cohorts and explore what worked and what didn’t work. Using the research gathered, principles from behavioural economics and journey mapping the service implementation will be evaluated and recommendations developed for the future of VitruCare. University of Salford, School of Nursing, Midwifery, and Social Work & Social Sciences. Given my age and lack of formal educational qualifications I’d have called you insane had you suggested two years ago that I’d be sharing the campus at the University of Salford with hundreds of bright young people. However, that’s exactly what has happened and the University has become my second home claiming that honour from another venerable Salford institution, Salford Royal Hospital. Apart from the occasional truly dreadful cup of coffee my experiences of the University have invariably been positive and inspiring.